Chocolate Fudge Filled hearts, the perfect Valentine's Day Candy. Milk chocolate with a rich fudge center in the shape of hearts. Each heart chocolate is individually wrapped in foil with hearts on. Perfect sweet treat to give your someone special. 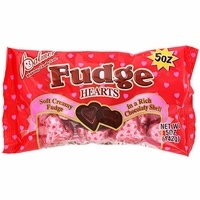 Each bag of fudge hearts has approx 12 pieces. 5oz bag of chocolate hearts from Palmer Company.